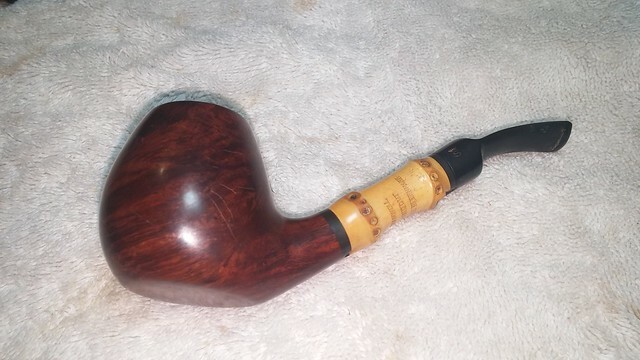 A lot of estate pipes require a fair amount of effort and energy to move from Thrift Store Decoration to Favourite Smoker or Prime Collectible. 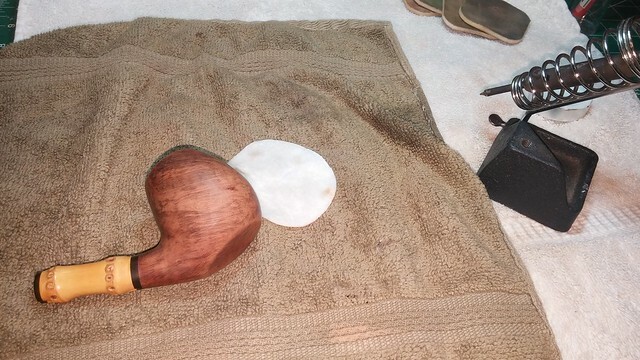 Every now and again, though, you stumble across one that seems to clean itself as the restoration work goes so smoothly. 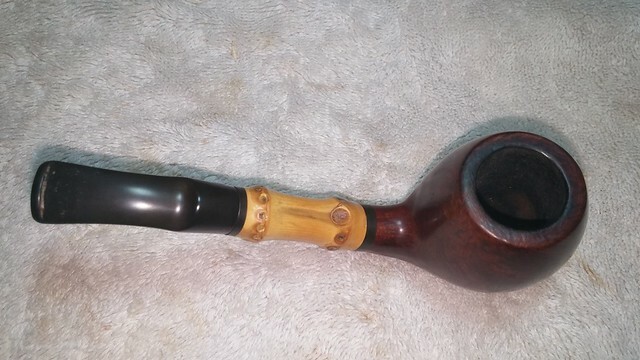 This Stanwell Bamboo was just such a pipe for me, accommodating at every stage of the cleanup. 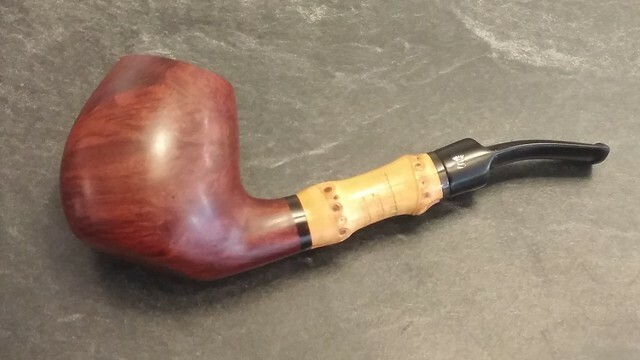 It’s a larger Stanwell sitter in a Bent Brandy/Volcano shape. 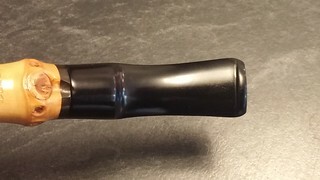 I’m not sure of the shape number, as the Bamboo series of pipes were not stamped with them. 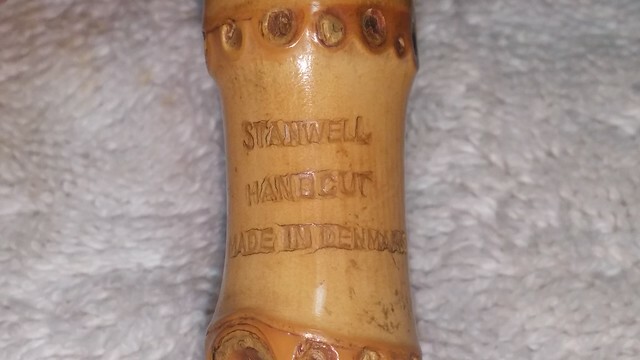 The pipe is marked only with “Stanwell” over “Handcut” over “Made in Denmark” on the underside of the bamboo shank extension. 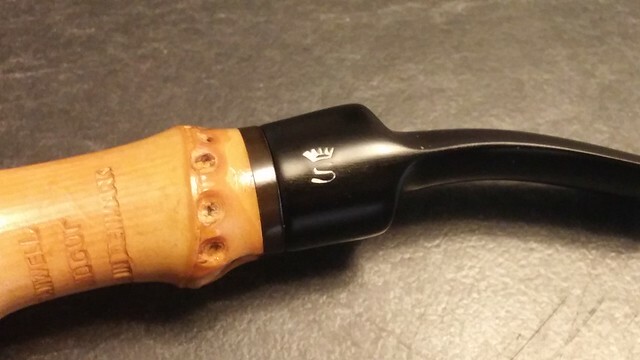 The short saddle stem carries the Stanwell Crowned S logo on the left flank. 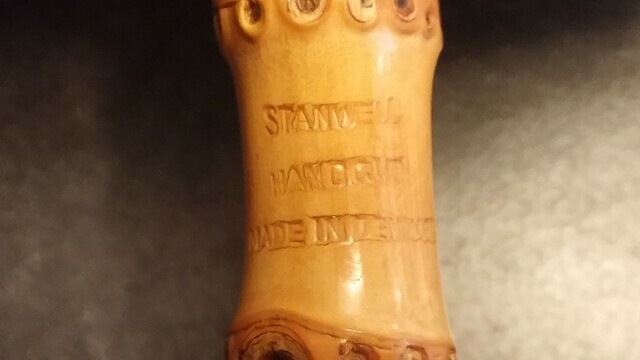 The stamps on both stummel and stem are particularly sharp and well-struck. 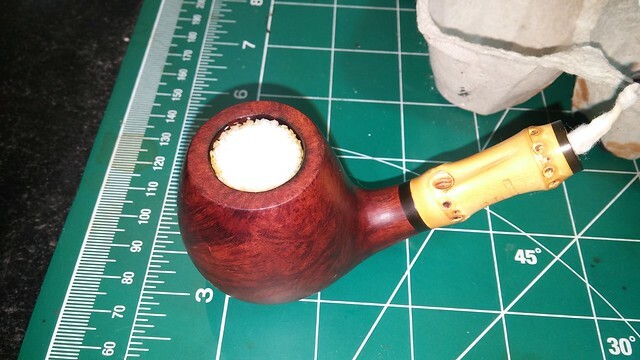 The pipe was in good used condition when I brought it to the worktable. 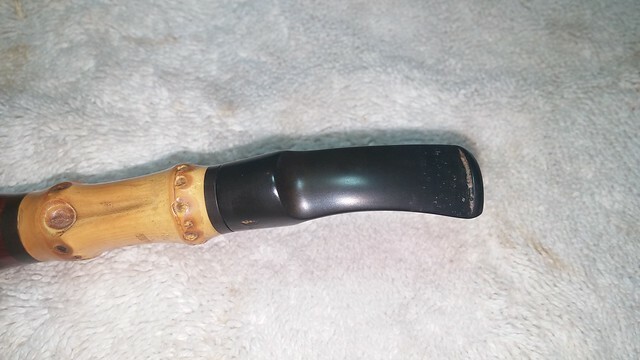 While there were noticeable scrapes, fine scratches and other handling marks, the pipe had not suffered any major trauma. 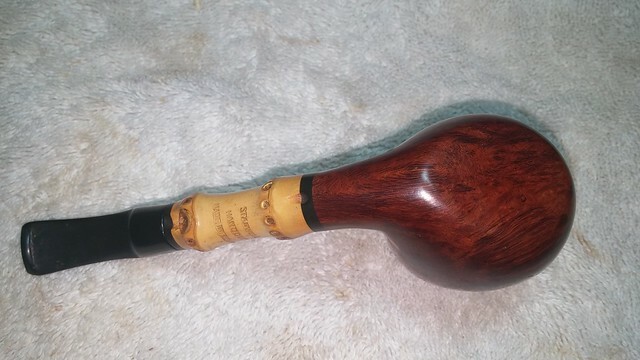 The inner rim of the bowl was a bit ragged across the back, and the stem logo had lost most of its paint, but this would be an easy refurbishment. 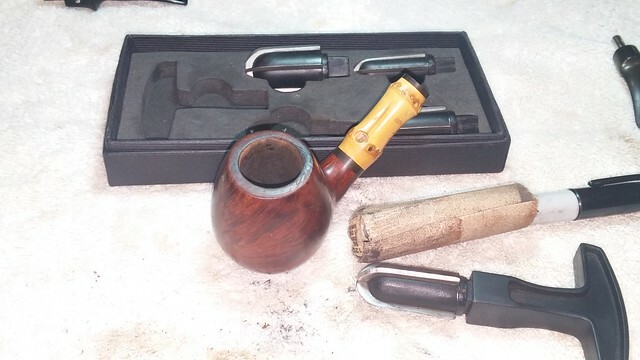 I began by giving the pipe a good cleaning. 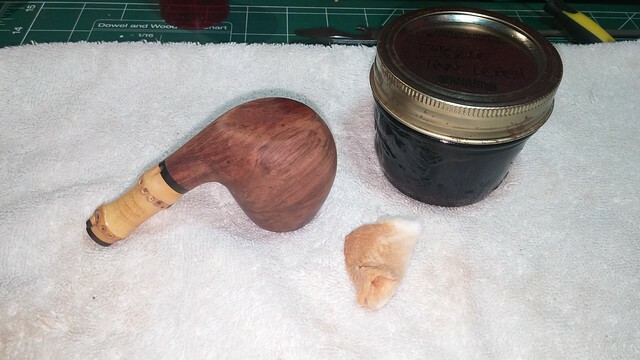 I reamed the bowl and used pipe cleaners and alcohol to clear the tars and debris from the mortise and airway. 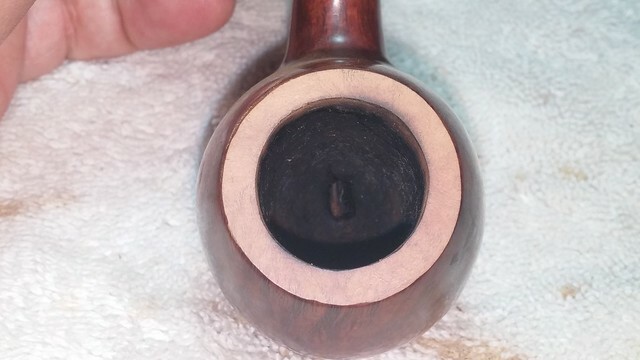 I topped the bowl lightly to remove the tars and smooth out the myriad small dings and dents around the inner and outer edges. The stem went into an Oxyclean bath to lift the dirt and oxidation from the rubber. 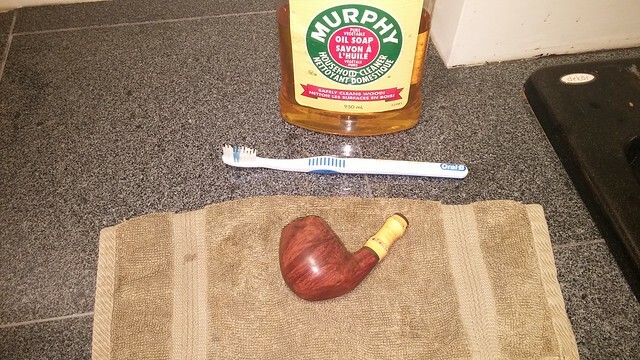 While I was at the sink, I scrubbed the old wax and grime from the stummel with Murphy’s Oil Soap and an old toothbrush. 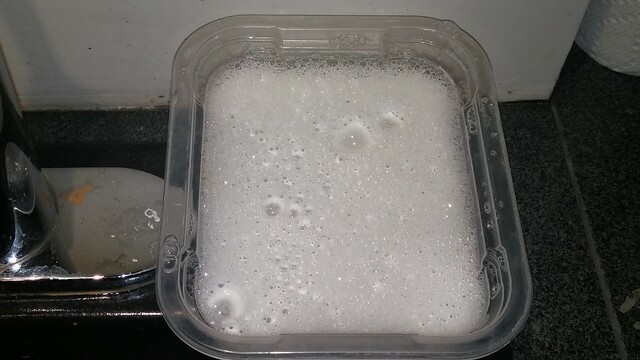 I scrub on the soap full strength, let it sit briefly and then rinse off under the tap. 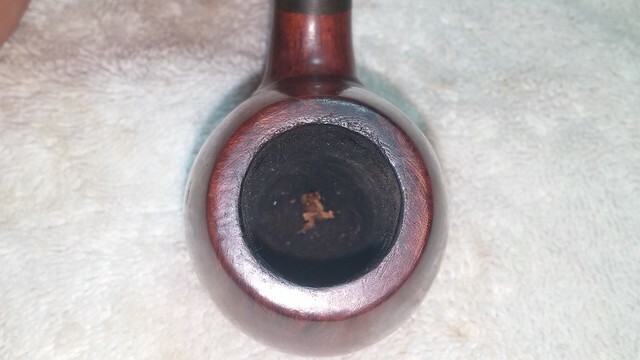 There were a lot of small scrapes and scratches around the outside of the stummel. A light sanding with medium and fine sanding sponges sorted them out. One deeper dent came to light during the sanding. 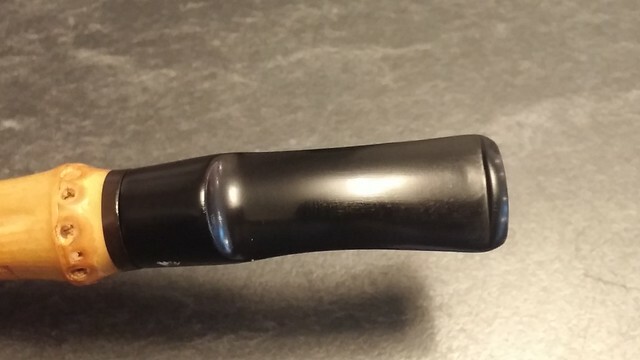 I experimented a bit here, using my electric soldering iron and a damp cotton pad to stem the dent out of the wood instead of busting out the much larger household clothes iron. 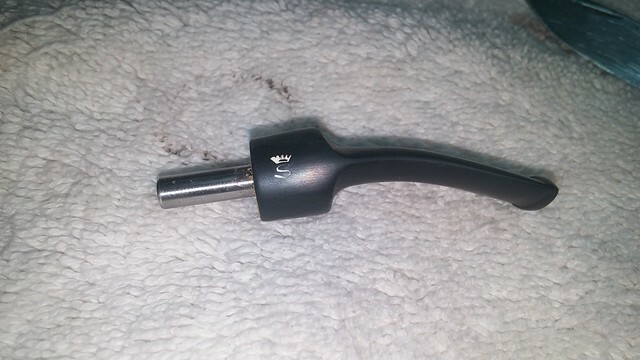 I found the soldering iron much easier to control; I’ll use this method again! 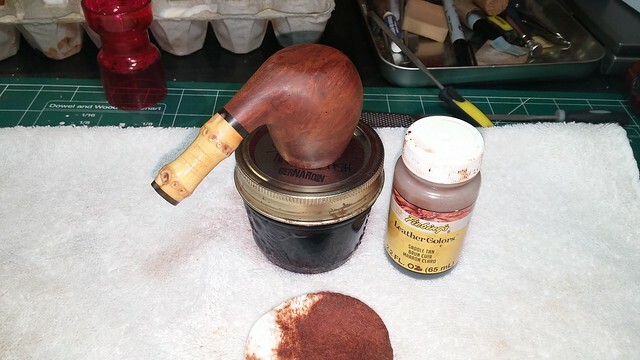 I refreshed the finish and stained the newly topped rim by first wiping a diluted wash of Fiebing’s Dark Brown leather dye over the briar and then top-coating the pipe with Saddle Tan dye. 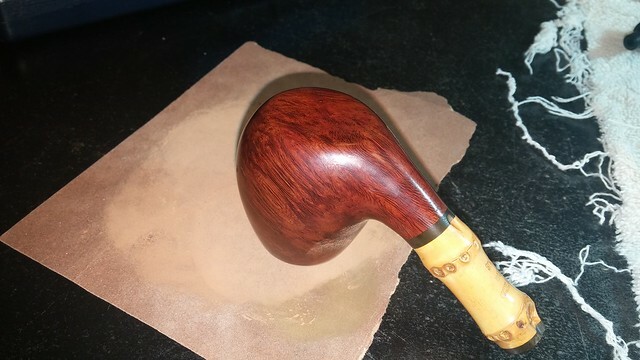 A light wipe with mineral oil refreshed the briar and gave the finish depth and pop. I set up the stummel with a salt and alcohol treatment and set is aside for 24 hours to let the treatment pull out the deep-set tars and odours. 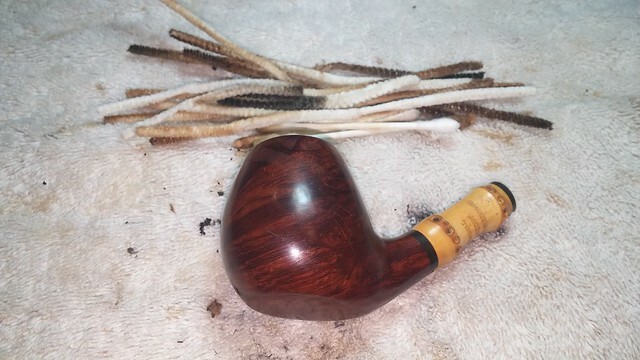 While the stummel sat, I pulled the stem from the Oxyclean bath and scrubbed it clean with a bit of Magic Eraser. 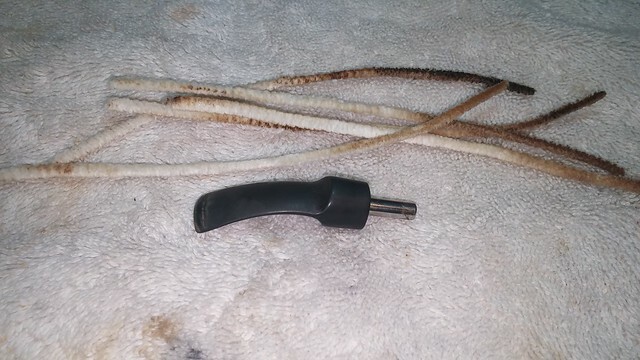 I needed only two pipe cleaners to freshen the airway through the stem. I also repainted the Crowned S logo at this point, dabbing a bit of white acrylic paint into the stamp and then scraping off the excess paint when it had dried. Remarkably, the stem was smooth and clear of tooth dents or chatter under the oxidation. 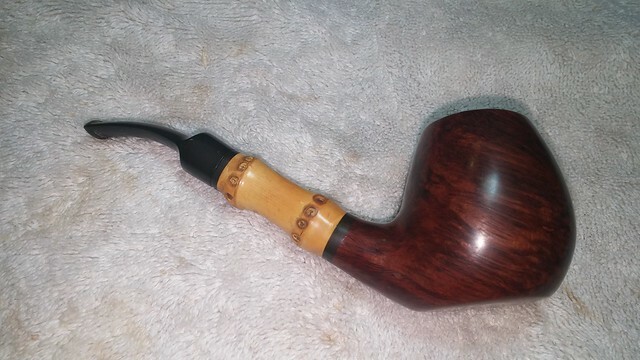 When the salt and alcohol had done their job, I dumped out the salt, wiped the bowl out and ran a pipe cleaner through the airway to remove any stubborn salt crystals before taking the pipe to the buffer. 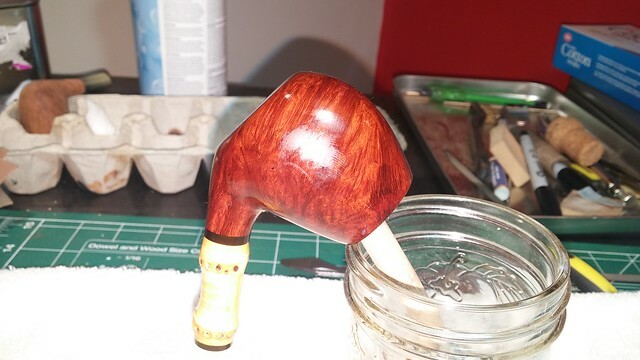 A run of White Diamond compound to stummel and stem was followed by several coats of Carnauba wax. 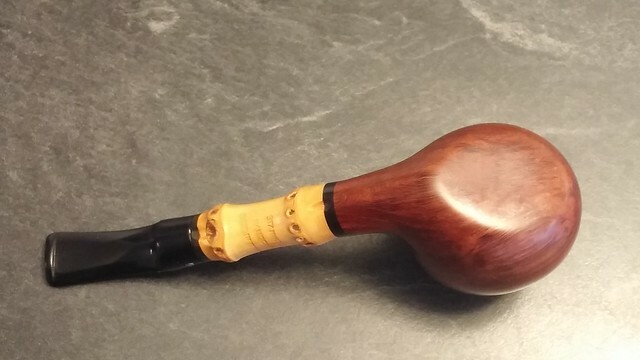 Just like that, this Stanwell Handcut Bamboo Sitter is ready for a new piper to fill its bowl and light up for a leisurely smoke. 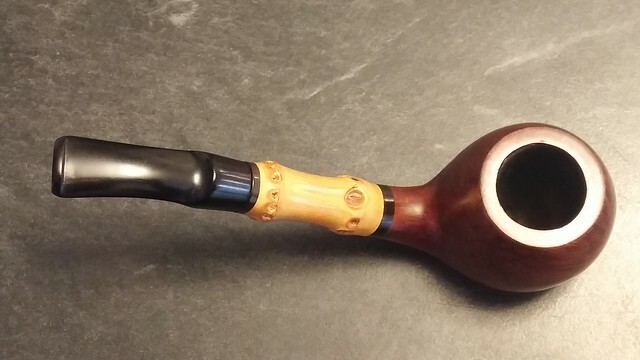 This pipe is certain to please its owner for many years. 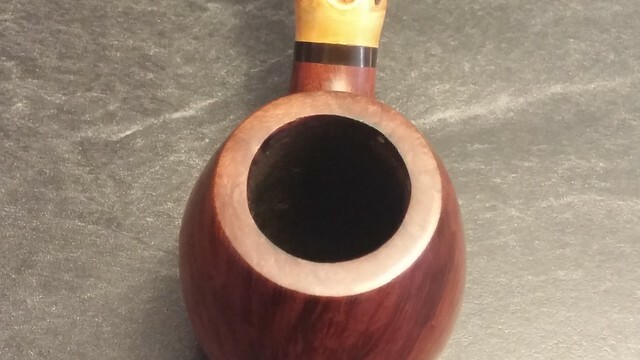 The drilling is spot on, the bowl has a healthy capacity for a favourite blend, and the hand-cut stem pushes the appeal of this sitter up a notch or two. 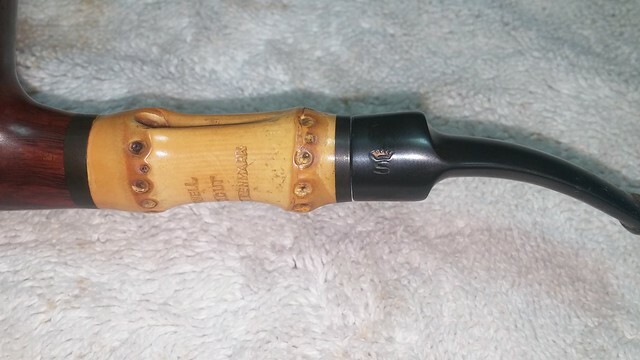 Notice in the pictures how the stem is notched to match the natural contours of the bamboo shank. The bamboo itself, now a pleasantly aged yellow, will continue to deepen in colour with use and time. 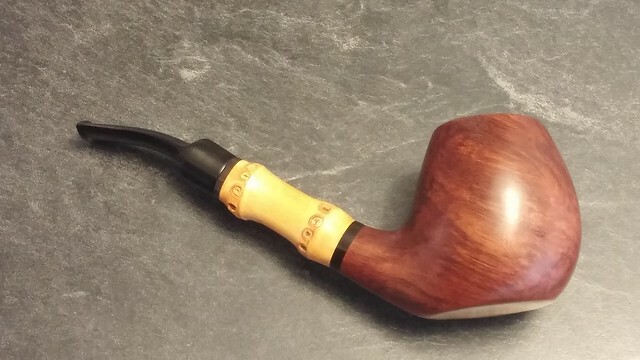 This pipe is available in the DadsPipes Store now. It would be a lovely addition to any piper’s rack and rotation.